It might be just the right time to spice up your portfolio, quite literally. The reason is simple. 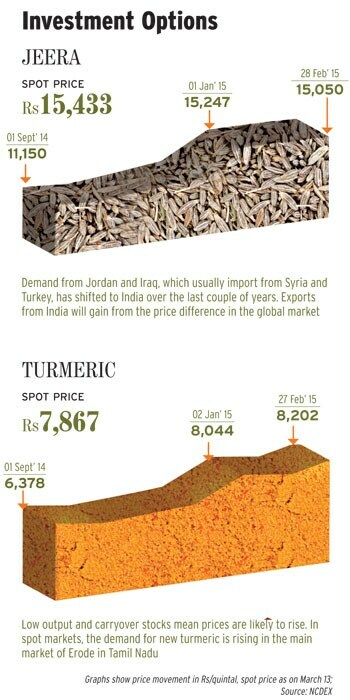 Turmeric, cardamom, chilli, coriander and jeera are some of the commodities on which experts are bullish for 2015. In six months till February 28, jeera and turmeric prices rose 35% and 29%, respectively, followed by cardamom (up 20%) and chilli (up 6%). However, coriander and pepper fell 38% and 18%, respectively. We bring the outlook for six spices that trade actively on domestic exchanges. CUMIN SEED (JEERA): Lower production pushed up prices from Rs 11,150 per quintal on 1 September 2014 to Rs 15,050 a quintal on February 28. Sowing is less this year due to delay in harvesting of kharif crops and weather uncertainty, says Kunal Shah, head of commodity research, Nirmal Bang Commodities. Also, farmers showed lack of interest in jeera due to poor realisations in the previous year. Jeera is usually sown in November & December. In Gujarat, till the end of December, the crop was sown over 2,59,400 hectares compared to 4,45,200 hectares at the same time last year. In Rajasthan, the second-largest producing state, the spice was sown over 3,39,000 hectares compared with 3,90,000 hectares in the previous year. The drop in acreage is 28%; in Gujarat, it is 42%. "Production is expected to fall 25-30% in 2014-15 due to lower acreage and erratic weather. We expect production of 2.75 lakh tonnes compared to 3.58 lakh tonnes in 2013-14," says Shah. Despite 35% lower production, India is likely to export 1,00,000 tonnes jeera this year, according to the Spice Board of India. This is mainly due to geopolitical unrest in Turkey and Syria. "Demand from Jordan and Iraq, which usually import from Syria and Turkey, has shifted to India over the last couple of years. Exports from India will gain from the price difference in the global market. We expect jeera to test the Rs 17,500 per quintal level in 2015," says Shah. TURMERIC: India is the largest producer, consumer and exporter of turmeric. Prices rose 29% in six months to February 28 (Rs 8,202 per quintal). For 2014-15, the opening stock is 32 lakh bags, while the output is expected to be 37 lakh bags, taking the supply to 69 lakh bags, 25% less than in 2013-14. "Domestic consumption and exports are likely to be 50 lakh bags and 10 lakh bags, respectively. Ending stocks are projected at nine lakh bags in comparison with 32 lakh bags in 2013-14," says DK Aggarwal, chairman and managing director, SMC Investments and Advisors. Low output and carryover stocks mean prices are likely to rise. In spot markets, the demand for new turmeric is rising in the main market of Erode in Tamil Nadu, which is a positive signal for the commodity. "Upcountry exporters are optimistic about fresh orders. Stockists are buying fresh quality stuff from new arrivals as there will possibly be a shortage in the future. This season, production is expected to be lower in major growing states such as Telangana, Tamil Nadu, Maharashtra and Andhra Pradesh," says Aggarwal. PEPPER: High supply in spot markets and expectation of good production have been pounding pepper prices for the past six months. Pepper was trading at Rs 58,563 per quintal on February 28 as against Rs 71,700 per quintal on September 1. Expectation that the Food Safety and Standards Authority of India will release the seized pepper in the market after cleaning also weighed on sentiment. Experts say production is likely to be 50,000 tonnes in 2014-15. The 2015-16 production is expected to be 70,000 tonnes, the highest since 2002. Imports are likely be the same as last year. Global production is also likely to be on the higher side. An International Pepper Community, or IPC, report says in 2015 global production is likely to be 3,74,200 tonnes. Production in IPC member countries is expected to be 3,44,500 tonnes, more than the last year's estimate of 2,88,700 tonnes. "Production in Vietnam, the top producer, is anticipated to rise. Other major producers, Indonesia and Malaysia, are also expected to produce more," says Hareesh V, research head, Geofin Comtrade. "Pepper prices are likely to remain mild during the year due to expectation of higher output and hope that the FSSAI will release the seized produce. Pepper is likely to trade at Rs 44,000-52,000 per quintal with a mild negative bias," says Hareesh V.
CHILLI: Prices of chilli rose from Rs 7,508 per quintal on September 1 last year to Rs 7,986 per quintal on February 28. Nidhi Chandel, assistant manager, commodity and currency research, Globe Commodities, says, "A 6% jump in chilli prices (Guntur) between September 2014 and February 2015 was due to 17% rise in export demand in April-September 2014, expectations of lower production in 2014-15 and limited stocks in mandis. The rise in September-October was triggered by limited supply from Madhya Pradesh and Maharashtra." India produces one-two million tonnes chilli a year; global production is 2-2.5 million tonnes. India is the largest consumer of chilli; nearly 80% of India's production is consumed within the country. In 2013-14, production was 1.2 million tonnes. Market experts say 2015 production and consumption will be similar to that in 2014. Chandel says, "We expect a mixed price trend till April on account of peak supply season in India and high export demand from Bangladesh, Malaysia and China. Once we are through with the peak supply season, prices may start rising gradually." CARDAMOM: Harvesting of cardamom is done in about six pickings from August to March. These are done at intervals of 35-45 days. Prices fell 9% between September 1 and December 10 last year. From there, they rose 31% to Rs 1,104 per kg on February 26. "Prices fell in October-November due to ample supply from the first two pickings. The carryover stock from the previous year also put pressure on prices. After that, unseasonal rain in Kerala's cardamom- growing areas pushed up prices," says Naveen Mathur, associate director, commodities and currencies, Angel Commodities Broking. "Fear about low production and quality of the produce (due to disease) from other pickings sparked demand from upcountry buyers and exporters," he says. Indian cardamom is in high demand globally due to superior quality. Trade sources estimate 2014-15 production at 18,000-20,000 tonnes. But given the erratic monsoon and likelihood of disease, production may be 20-25% lower at 15,000-16,000 tonnes, say market experts. Demand for cardamom has been rising due to increased use in food, medicines and cosmetics, and is estimated to be 22,000-25,000 tonnes a year. In 2014-15, arrivals up to February 7 were 13,099 tonnes as against 14,046 tonnes in the same period last year. Besides India, major producers are Guatemala, Sri Lanka and Tanzania. The factors one must look at before investing are domestic supply, climate in growing regions of Kerala and Karnataka and demand from West Asia. The other factors are production in Guatemala, India's main competitor. One must also keep an eye on imports as cheap supplies from Guatemala in March-April suppress prices. The penultimate round of picking is on and harvesting is expected to end by March 31. Experts say production is expected to be 20-25% lower this year. Low carryover stocks, increase in domestic demand in the festive season and rise in exports may keep prices high in the long term. "Cheaper cardamom from Guatemala, which has started arriving in India in March, may drag down prices during March-June. In the second half of the year, prices will depend on the monsoon. Lower production in Guatemala this season and import duties may keep prices high. Cardamom may touch Rs 1,170-1,380 per kg and find support at Rs 900 and Rs 700 during the year," says Mathur. CORIANDER: Prices fell from Rs 11,253 per quintal in September to Rs 6,926 at the end of February. "Expectation of higher production and weak demand are keeping sentiment weak," says Ajitesh Mullick, assistant vice president, retail research, Religare Securities. Coriander is sown mainly in Rajasthan but sowing has picked up in Gujarat too due to high prices last year. This, and rains during sowing in October-December last year, kept production high. Rajasthan is expected to produce 80-90 lakh bags (1 bag = 40kg) and Gujarat 30-40 lakh bags. These figures are 40-50% higher than last year. "The short-term trend is still weak as arrivals continue till April. The NCDEX Dhaniya April contract, trading at Rs 6,300 per quintal, has immediate support at Rs 5,900-6,000 and long-term support at Rs 5,400-5,600. From mid-April, once arrivals slow and demand rises, price recovery will be possible. Long-term resistance levels are Rs 7,100 and Rs 8,400. We expect short- to medium-term bearishness and long-term bullishness for the commodity," says Mullick.